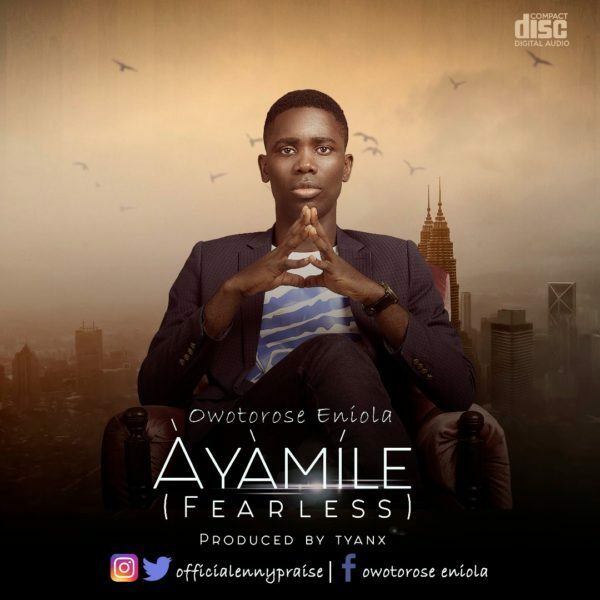 Eniola Owotorose widely known as Enny Praise release new single titled ‘Àyàmíle [Fearless]‘. Eniola Emmanuel Owotorose was born in Irun-Akoko Akoko North, of Ondo State. He is a native of Ekpedo, North-east Akoko, Edo State, Nigeria. Eniola was inspired right from childhood through the ministry of music prodigy Don Moen and Dr. Panam Percy Paul, a prominent Nigerian gospel music icon. Under the tutelage of Sunday Olorunfunmi and Gbenga Oloruntola, he learnt the rudiments of music as a young lad. Eniola developed a strong passion for Church music such that at age 14 he started chasing his musical career by writing songs himself and singing in the choir, and at age 16 which was uncommon, he became the music director at his local parish. More than just knowing the rudiments of music and possessing a voice so divinely created, Eniola is a music minister who combines both worship and praise so perfectly. He is currently the Music Director in one of the fastest growing Provinces of the Redeemed Christian Church of God. Eniola also fondly called EnnyPraise, he is a graduate of the prestigious University of Lagos where he studied Accounting and he is married to Temitope Owotorose who is also a powerful gospel minstrel. Eniola and Temitope are blessed with lovely children. Àyàmíle is produced, mixed and mastered by Tyanx.